In this episode, Athena travels to Sparta and instructs Telemachus to go back to Ithaca. She also warns him about the trap that the suitors have set to kill him before he gets home. She tells him how to avoid the trap and says that he should go to the house of the swineherd Eumaeus before returning to his home. As this is taking place, Odysseus is still at the home of Eumaeus where they continue to share stories. I don’t have a whole lot to say about this particular book. It seems like pieces are being set in motion and moved into place. There did seem to be an emphasis on omens, though, especially concerning birds. Telemachus is presented with two omens. The first one is interpreted by Helen. will soon come down in fury on his house. he brings upon the suitors. The second omen is interpreted by Theoklymenos. A god spoke in this bird-sign on the right. I knew it when I saw the hawk fly over us. will be in power forever. I have personally had some life-changing events happen in my life following “unusual” encounters with birds. I’ve come to believe that when you have an encounter with a bird that is out of the ordinary, it is definitely a sign. I’m curious—have any of you had an encounter with a bird and had something significant happen afterwards? Feel free to share your stories. In this book, Athena disguises herself as a young girl and guides Odysseus to the palace of Alkinoos, Nausicaa’s father and king of the Phaeacians. Odysseus is awestruck by the splendor of the palace. 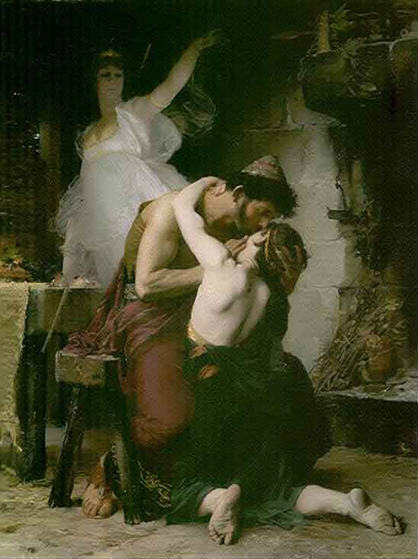 When Odysseus meets the king and his wife Arete, Alkinoos questions whether Odysseus is a god, to which he replies that he is mortal. Odysseus then tells the story of how he came to Phaeacia while withholding his true identity. 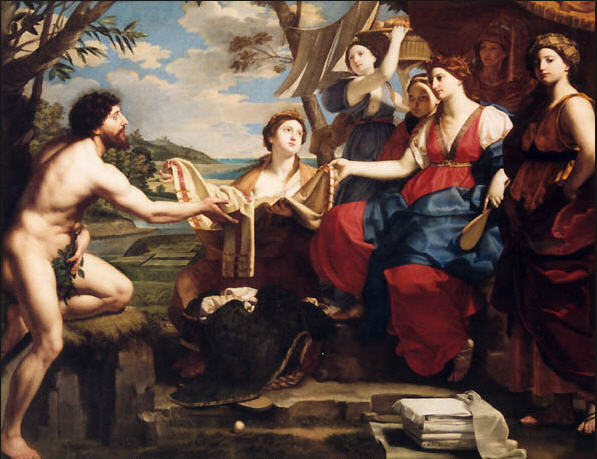 Alkinoos agrees to help Odysseus return home and also offers Odysseus Nausicaa’s hand in marriage. This is a fairly short book, and much of it is description of the palace and gardens, and Odysseus recounting his journey from Calypso’s island. One passage stood out for me, though. versed in the laws and manners of old time. a guest abased in ashes at our hearth? and gave the shining chair to Lord Odysseus. So in this section, we have Odysseus placing himself by the fire and sitting in the ashes. He is then raised from the ashes and given a seat of honor beside the king’s throne. 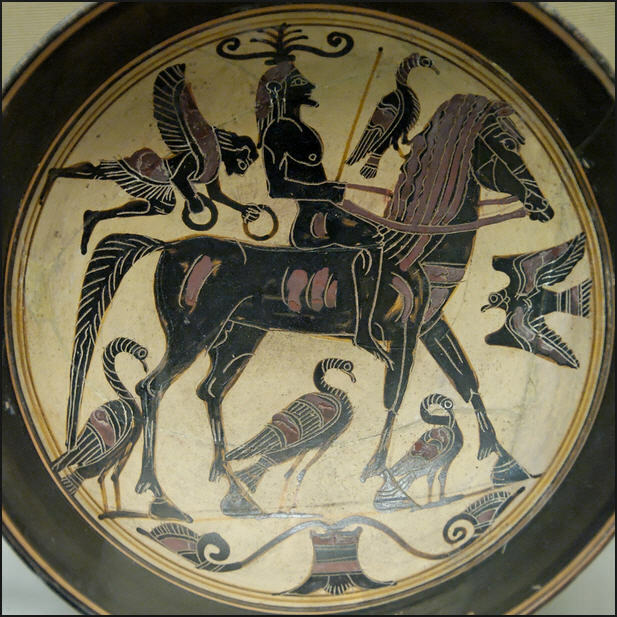 I found this to be a symbolic association between Odysseus and the Phoenix. 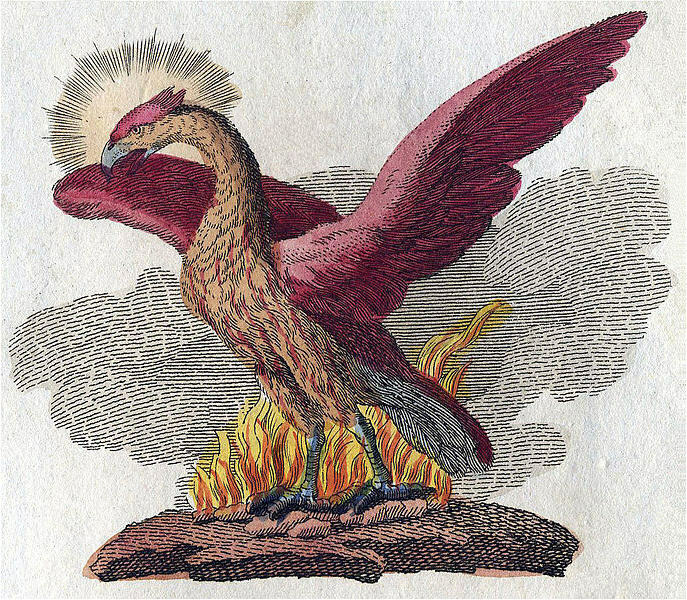 The Phoenix is one of the most recognizable symbols of rebirth and regeneration, dying in fire and then resurrecting from the ashes. But what I find the most interesting about this is that Odysseus seems to be going through a series of rebirths, with each one being associated with a different element. So in Book V, Odysseus experiences a rebirth through the element of earth, as he is buried beneath the leaves. In Book VI, he is reborn again and this time the rebirth is associated with the element of water, as he is cleansed and purified in the river. Now, in Book VII, we see Odysseus reborn through the element of fire. Homer draws on the various symbols of resurrection, connects them to the elements, then weaves them all together into the hero myth. In my opinion, this is nothing short of poetic genius. I really have nothing else to say about this book. I’m still in awe. As always, please feel free to share your thoughts and comments. Cheers! This is the first book in the epic where we actually encounter Odysseus. 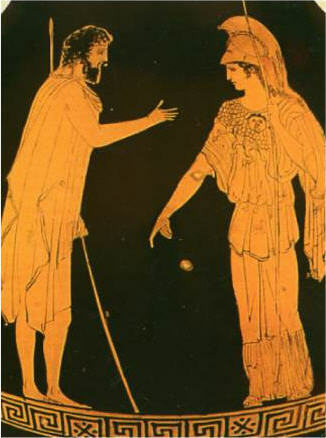 After Athena convinces Zeus to intervene on Odysseus’ behalf, Zeus sends Hermes to Calypso’s island and instructs her that it is Zeus’ will that Odysseus is released. Calypso helps Odysseus build a raft and give him provisions. After leaving the island, Odysseus spends 18 days at sea (18 being 2×9; remember the importance of the number 9 in Book III). 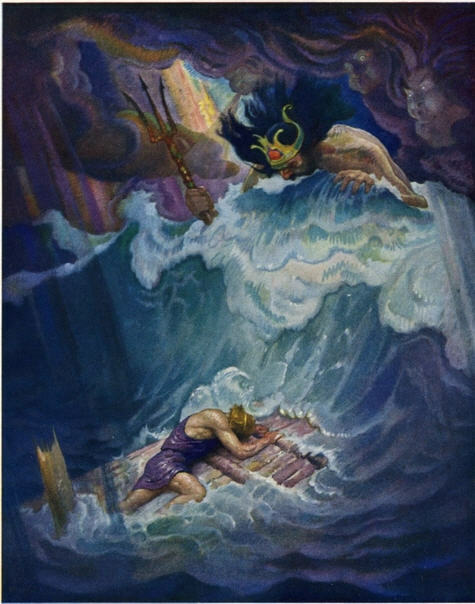 Poseidon then creates a storm that strands Odysseus on the island of Scheria. that his distress should end, and soon, soon. In quiet sleep she sealed his cherished eyes. This passage was the most interesting for me. I interpret this as a symbolic rebirth of Odysseus. The ember is the spark of consciousness that continues to live after one’s physical body dies. 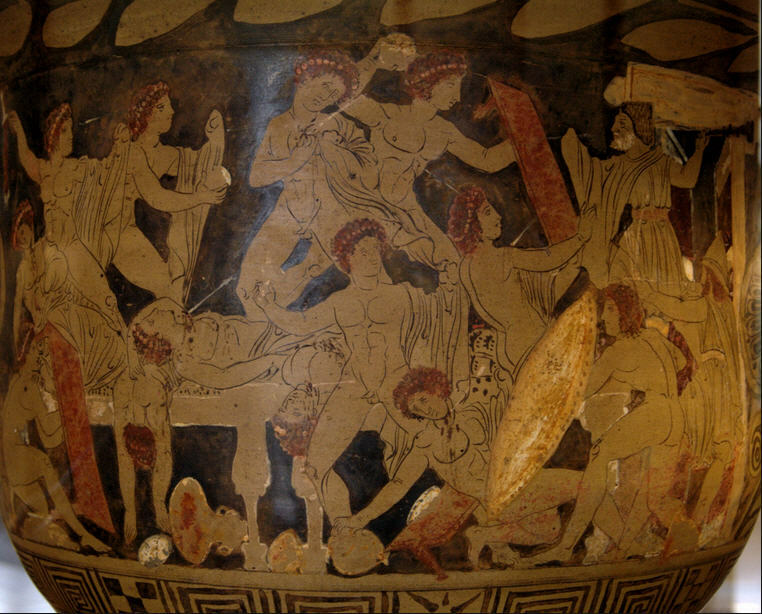 Odysseus is then buried under leaves, which represents death. Even the fact that Athena “sealed his cherished eyes” implies something more than just normal sleep, adding a sense of permanence to his state. But the spark of the divine consciousness remains, and when the new day dawns, it will reignite Odysseus’ consciousness and resurrect him from his grave beneath the leaves. The symbolic rebirth of the hero is not uncommon in epic literature, and I would not be surprised if this theme presents itself again further on in the text. Thanks for taking the time to read my thoughts, and have a blessed day!